Old Houses, Old Wiring, and Ceiling Fans – Jenny and Jonathan Got Married! 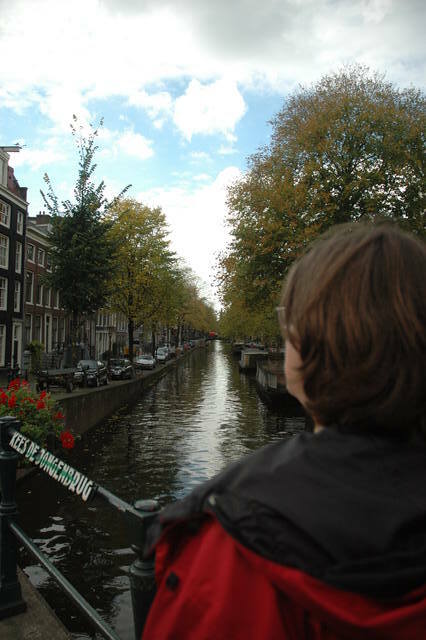 Why, hello, blog! It has been a while. It has also been quite a while since I’ve posted much here about work on our old house. Part of that is because I really haven’t done much of substance lately on the house. Well, I’m out to change that (slowly), so here we go…. Tl;dr: I installed a ceiling fan in the bedroom of our old house. I was nervous about it and had put it off for years as a result. With planning and preparation, it was fine. We have a fan. Yay. Several years ago, Jenny and I had whole-house A/C re-installed in the house. Yes, RE-installed. Short version of another long story: When I was buying the house (before there was a Jenny), the house inspector didn’t want to turn on the furnace to test it. There was water pouring through the firebox from the retrofitted A/C condenser. There was no drainage–the condenser drained over (and into) the heat exchanger and firebox, which then drained onto the floor, where the water just sat until it evaporated on its own. The inspector took one look at the firebox and said, “Nope.. Not testing this. I’d rather not have to explain why I blew up the house I was inspecting.” And that was it. After I got the official report, I asked the seller to either replace the furnace or accept a discount on my offer. The seller agreed to replace the furnace, and I thought all was well, until I did my closing day walk-through. The furnace was indeed replaced, but the compressor had been removed from outside. It turns out that the seller had listed the compressor as “possibly needing replacement” on the disclosure form, which absolved them from replacing it when the furnace was replaced. Oof. Yet another lesson in real estate dealing learned the hard way. I moved in that week and brought the window unit from the bedroom in the house I was renting in Mt. Washington, and went on living with the only A/C being in the bedroom. We really appreciate having A/C in our old house. Yes, it has good ventilation, and when windows are opened in the right order, the natural ventilation works well. But that doesn’t help a whole lot with a cat who is an escape artist, coupled with a desire to keep the ground-accessible windows secured when we aren’t home. It also proves to be a huge help controlling humidity in the house, and specifically the dampness that likes to take over the basement in the spring and fall when the rains come. It is a welcome benefit while working on a project inside the house, and when coming in from work outside when it is hot. Since it is a whole-house system with a single zone trying to cool four floors (counting basement and the third floor), temperature on each floor is a bit of a compromise. I always go around during the transition from heating season to cooling season and adjust dampers and registers to help direct temperature control where it is most needed, but I can’t overcome physics. The basement is always coolest, the first floor is always the temperature we have set on the thermostat, the second floor with the bedrooms is always about three degrees off (cooler in the winter, warmer in the summer), and the third floor is always about three degrees off from that (in the same direction). While I dream about someday installing an auxiliary unit on the third floor to provide some help to the second floor, that’s a long way and a lot of dollars away. What’s an easy way to make a few degrees of apparent difference, though? Circulate some air! A really nice way to do that is with a ceiling fan, which can be used all year long to increase overall comfort in a space. I decided to do this in our bedroom quite a while ago, but I knew it would be neither easy nor fun. I already knew that our ceiling fixtures were still knob and tube, run down from the third floor. I knew I would have some access to them through the floor boards that had been pretty expertly modified when the house was retrofitted for electricity, but I also knew that the front bedroom board was especially hard to access, as it had been covered with a piece of linoleum at some point. I intended to use an install-from-below box, because I didn’t think I would be able to access it from the third floor without doing a lot of damage to the floor. I suspected that the second floor never had gas lighting, other than a single port in the wall for a “portable” stand fixture in the front bedroom. That meant that there would be no hard mounting point I could use in the ceiling, but it also meant that I wouldn’t have to try to remove an old gas line to install an electrical box for the fan (which, being the “right” way to do it, is what I wanted to do). 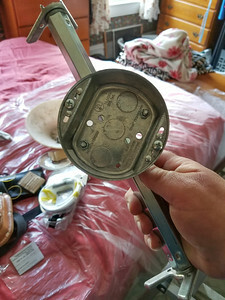 I figured that there was no box above the old fixture, but what was there would be a mystery until I took the existing fixture apart. It was Memorial Day weekend, and I had a day available. The weather was supposed to be unfavorable, and Jenny had plans with her family, so I decided today would be the day. Before Jenny went off to Berlin, I had her help me to locate the circuit for the light. As it turns out, that one circuit feeds most of the outlets and all of the ceiling fixtures on the second floor. Grr. Old house problems. With the circuit disabled, she went off to Berlin, and I got to work. Before buying anything, I needed to get the old fixture down and see what I had to work with in the ceiling. First step was to move the bed out of the way as much as possible, and then to cover everything underneath the fixture with some disposable drop cloth (in this case, plastic sheeting designed for just this sort of thing, which we had from working on the first floor rooms). I knew I’d encounter soot, dust, possible plaster dust, and who knows what else above a fixture that had been hanging in the same place for probably 70+ years, and I really didn’t want to encounter any of that in the bed, carpet, etc. after the fact. 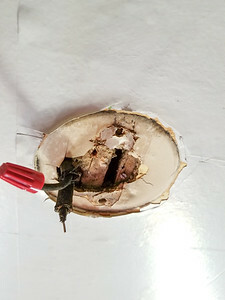 Removing the old fixture was easy, after scoring through several layers of paint between the base and the ceiling. Once removed, I found sort of what I was expecting: The plaster had been chipped away down to the wooden lath, the wiring had been poked through the gap between two lath boards, and there was a simple threaded mount screwed (poorly) to the lath boards. 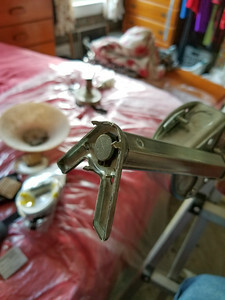 From this threaded mount, a spreader was hung with a nut, and the fixture attached to that with decorative bolts. The wiring was twist-spliced and covered with tar tape (ugh, messy). The insulation on the knob and tube branch wiring was still in decent shape, which was good because there was no way to access enough of that to replace it yet (another dream, but I need some professionals and many dollars to finish that job the right way). I was able to shine a light through the gaps in the lath boards to see that there were convenient and regularly-spaced joists in the orientation I had guessed (left of house to right of house), and there was some space to both the front and back of the existing mounting location, which meant I had room for a hanger bar. I had been worried that the threaded fitting could be secured directly to a joist, which would have meant offsetting the new fixture forwards or backwards to have room for a proper box and hanger. 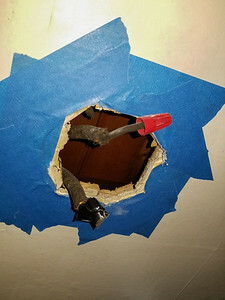 Now I knew that I needed a fan, I needed an old-work hanger box and brace, and I needed to cut a 4” hole in our ceiling. I dreaded this part of the whole operation. I figured it was coming before I even took down the existing fixture. But now I knew for sure. 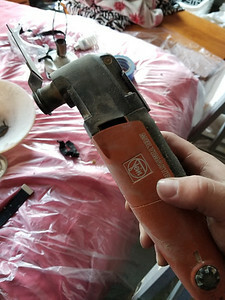 I also knew, though, that I had absolutely one of the most appropriate tools for the job: The Fein MultiMaster oscillating tool. I bought this in 2004 on several recommendations from old house owners who said it would be the best $450 I ever spent on a tool. They weren’t wrong. Fein held the rights to this thing for a long time, and they were the only one on the market until fairly recently. Now, there are competing tools from Bosch, Dremel, and probably a few others. 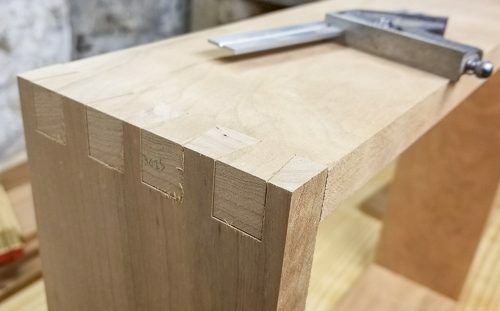 In any case, it isn’t needed often, but holy cow, when there’s an odd job for something that can sand, cut, grind, or chisel, this is the thing to do it quickly. We used it a lot when working on the downstairs rooms, and then it went back to live in its case for a while. Today, it would get to stretch its legs a bit. Armed with knowledge of what I had to work with, I set off for Home Depot in East Liberty. OK, some of you are now staring at me (well, at the screen) and saying out loud, “You’re 10 minutes from the Lowes across the river, why didn’t you just go there?” Well, I have a few reasons. One, I know the Home Depot in East Liberty stocks some things for working on old houses in larger quantities than Lowes does. They have a larger customer base for those items. As a result, the employees also have more familiarity with the items needed and work that has to happen in older houses. I also knew that they stocked the brand of fan I liked, and that they had accessories for the MultiMaster. Thanks to the magic of the Internet, I was able to look up the items I needed online while I sat in the parking lot, get the appropriate aisles and bin locations, and then just go on my mission. This saved a ton of wandering and guessing time and let me spend some of that time on considering which fan model I liked best. In addition to the fan and hanger box, I also picked up pet-resistant screening to replace ones the cat has torn through, caulking for the second floor tub, a couple of carbide cutting blades for the MultiMaster (our plaster is hard and destroys non-carbide cutting tools in a matter of seconds), dust masks, and a roll of wide painter’s tape. Then, I went and enjoyed a great lunch at a place I’ve never been before, BRGR (East Liberty location). Yum. Highly recommended. Back at home, I lugged tools, fan, and etc. upstairs. Since it seemed like there were no easy to access outlets with power on the second floor, I had to run an extension up the stairs from the first floor to get power. I pulled the curtains aside, which let in plenty of natural light, so I did not need additional lighting. I would need power for the MultiMaster and later for a vacuum, and I hoped to be finished without having to pull out auxiliary lighting. After removing what was left of the old fixture and cleaning up the wiring, I used the outline of the new box to trace a circle on the ceiling, then outlined that circle with wide painter’s tape. I was going to have to cut through the plaster and lath, and I wanted to try to reduce the damage to the plaster around the location of the cut. Painter’s tape is a great way to assist with that, whether drilling a hole to mount something, cutting out for an electrical box, or making a giant hole in an irreplaceable ceiling, as I was about to do. I also knew that with a dust mask and safety glasses over my eyeglasses, everything was going to fog up quickly and I’d need cutting guides I could see. This worked great for that. Using the MultiMaster with a straight carbide cutting blade, I began making plunge cuts in a shape approximating a circle. I know a RotoZip might be a better tool for a circular hole, but I didn’t have one of those, and I was trying to keep the cost of this project down. I already owned the MultiMaster, so it won. Several cuts later, I was covered with plaster dust, the drop cloth was covered with plaster dust, the cat sniffed it once, sneezed, and left (and I was oh so glad about that), and I had a 4” hole in the ceiling. It doesn’t sound like much, but I was terrified of doing this. The ceiling cavity was surprisingly pretty clean. There wasn’t much soot up there, which initially surprised me. When I thought about it, though, the first floor had gas lighting, which released a lot of soot (that’s one reason why old houses had medallions above the lighting fixtures). No gas lighting on the second floor meant a lot less soot, so that was a win. Installing the hanger brace and box was relatively straightforward. The ones made for old work are surprisingly easy. Pop the box and bracket off of the brace, put the brace up through the hole and rest the bases against the inside face of the ceiling, then turn the middle part until the teeth dig into the joists. 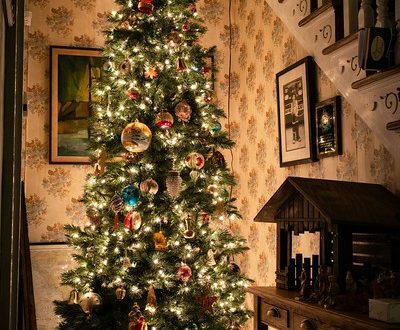 The one I got was rated for something crazy like 150 pounds–probably enough to anchor something like our giant solid brass chandelier in the dining room. It turned out to be a little more recessed than I wanted, but I didn’t have a good way to fix that. It was figuring on ½” ceiling thickness, and this plaster was maybe 3/16” thicker. This would later provide an unexpected challenge, and resulted in my only additional trip to a hardware store. While assembling the fan and attaching the base plate to the box, the existing mounting screws provided with the box were not long enough. I also needed some washers to level and accommodate for the thicker plaster. This time, I did go to Lowes, and grabbed some longer 10-32 screws and a bag of #10 washers. 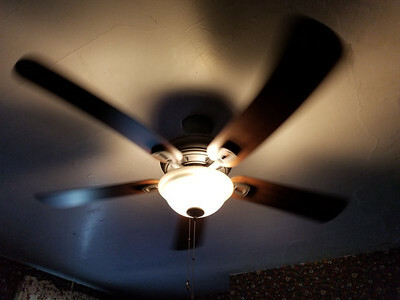 The rest of the fan installation was pretty smooth. Conveniently, once hung in its bracket by the motor mounting ball, it swings itself to level, and there is plenty of room to work on wiring without having to hold or strangely support the motor. I was happy to flip the breaker back on, come upstairs, flip on the switch, and have a working fan and light! I cleaned up my messes, stored the old fixture carefully, and vacuumed the floor. Then I threw my dirty clothes in the laundry basket, showered to clean myself of plaster dust and grime, and enjoyed the nice moving air in the bedroom for a bit before calling my Dad to see if he wanted to join me for dinner at Beermuda. Jenny arrived home while we were at dinner, and we had an incredibly comfortable sleep under our new fan that night. The difference a little bit of air movement makes is profound. This is one of those projects I really wanted to tackle, but my anxiety over the process kept me from attempting it. Now that I’ve done it once, I’m a lot less hesitant to do it again. I’m figuring on installing fans in the other two bedrooms, too, and I would like to install a ventilation fan in the bathroom to pull steam out when we’re showering. I might hire someone to help with that mess, though, as that will also need a hole in the wall for the vent. I’m OK now with putting holes in ceilings and interior walls, but I’m not quite at OK with holes in exterior walls yet…. We’ll see. Thanks for reading this far. More work to come! Jonathan does a lot of stuff. If you ask Jenny, maybe he does too much stuff.